The Kenyatta National Hospital is East Africa’s biggest medical institution, home to more than a dozen donor-funded projects with international partners — a “Center of Excellence,” says the U.S. Centers for Disease Control and Prevention. The hospital’s website proudly proclaims its motto — “We Listen … We Care” — along with photos of smiling doctors, a vaccination campaign and staffers holding aloft a gold trophy at an awards ceremony. But there are no pictures of Robert Wanyonyi, shot and paralyzed in a robbery more than a year ago. Kenyatta will not allow him to leave the hospital because he cannot pay his bill of nearly 4 million Kenyan shillings ($39,570). He is trapped in his fourth-floor bed, unable to go to India, where he believes doctors might help him. At Kenyatta National Hospital and at an astonishing number of other hospitals around the world, if you don’t pay up, you don’t go home. The hospitals often illegally detain patients long after they should be medically discharged, using armed guards, locked doors and even chains to hold those who have not settled their accounts. Mothers and babies are sometimes separated. Even death does not guarantee release: Kenyan hospitals and morgues are holding hundreds of bodies until families can pay their loved ones’ bills, government officials say. Dozens of doctors, nurses, health experts, patients and administrators told The Associated Press of imprisonments in hospitals in at least 30 other countries, including Nigeria and the Democratic Republic of the Congo, China and Thailand, Lithuania and Bulgaria, and others in Latin America and the Middle East. The AP investigation built on a report last year by the British think-tank Chatham House; its experts found more than 60 press reports of patient detention in 14 countries in Asia and sub-Saharan Africa. Hospital detentions, some experts argue, can be traced to policies pushed decades ago by the World Bank, the World Health Organization, UNICEF and others who made loans to developing countries on condition that they charge patients fees for medical services. Without explicit protections in place to protect the poor, they say, the policies gave countries the freedom to extract health-care payments however they saw fit — including detaining patients. The practice appears to be most prevalent in countries with fragile, underfunded health systems where there is little government accountability. But the problem has also surfaced in wealthier countries, with patients being detained in hospitals in countries including India, Thailand, China and Iran. In many countries when patients cannot afford to pay for health care, they are usually either sent to a public hospital where treatment is covered by the state or refused help altogether. 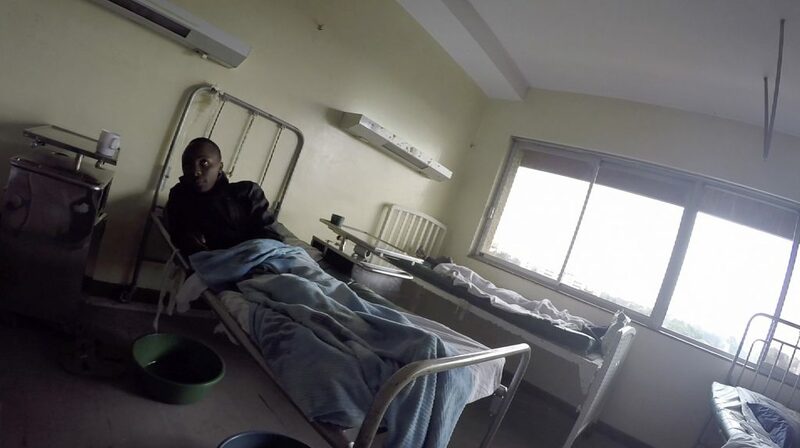 In some hospitals in Cameroon and elsewhere, for example, the problem of patient imprisonment was solved by some institutions by simply demanding payment up front. Where patients are imprisoned, hospitals acknowledge it is not necessarily profitable. But many say it often leads at least to partial payment and serves as a deterrent. Unlike many hospitals in developed countries, African hospitals don’t always provide food, clothing or bedding for patients, so holding onto them does not necessarily incur a significant cost. Detained patients typically rely on relatives to bring them food while those without obliging family members resort to begging for help from staff or other patients. Dr. Festus Njuguna, a pediatric oncologist at the Moi Teaching and Referral Hospital in Eldoret, about 300 kilometers northwest of Nairobi, said the institution regularly holds children with cancer who have finished their treatment, but whose parents cannot pay. The children are typically left on the wards for weeks and months at a time, long after their treatment has ended. “It’s not a very good feeling for the doctors and nurses who have treated these patients, to see them kept like this,” Njuguna said. Still, some officials openly defend the practice. At many Kenyan hospitals, including Kenyatta, officials armed with rifles patrol the hallways and guard the hospital’s gates. Patients must show hospital guards a discharge form to prove they’re allowed to leave and even visitors must sometimes surrender their identification cards before seeing patients. In its 2016 financial report, Kenyatta’s auditor-general said the hospital lost more than $470,000 in fees from patients who “absconded” without paying. That year, the hospital reported total revenue of more than $115 million. Patient detentions at Kenyatta have been flagged for years, among other concerns. Kenya’s Human Rights Commission attempted to conduct an audit of Kenyatta, but officials refused to cooperate and have ignored all requests for information about detained patients. He said patients have been held at Kenyatta for up to two years, and it was reasonable to suspect that hundreds of patients could be detained there at any time. Kenya’s ministry of health and Kenyatta canceled several scheduled interviews with the AP and declined to respond to repeated requests for comment. After she was elected to Kenya’s Parliament, Esther Passaris visited Kenyatta last December to check on supporters who were injured in election violence. She was stunned to find that patients were incarcerated. “There was one lady I met in the corridor and she was crying, ‘please let me go home,'” Passaris said. The woman had hurt her back and hip. She had been medically cleared to leave, but wasn’t allowed to go home because she hadn’t paid her bill. Passaris started an online campaign to have the patients released. Just before the end of the year, Kenyatta let more than 450 leave — a victory, Passaris says, though the problem remains. Foreign agencies and companies that operate where patients are held hostage typically have very little to say about it. Some experts said the international health community’s failure to address the issue has undermined its own goals. The CDC provides about $1.5 million every year to Kenyatta and Pumwani Maternity Hospital, via funding from the President’s Emergency Plan ,PEPFAR. At Kenyatta, the CDC covers treatment costs for patients with tuberculosis, trains health workers and helps with testing, among other programs. The agency declined to comment on whether it was aware that patients were regularly detained at Kenyatta and Pumwani or if the agency condones the practice. Among its other partnerships, Kenyatta has been working with the University of Washington for more than 30 years. Dr. Carey Farquhar, director of the university’s Kenya Research and Training Center, said she didn’t recall seeing any detained patients at Kenyatta, though was not surprised that it happened — she knew of no hospitals there that did not detain patients. “It does make me uncomfortable,” she said. The drugmaker Novartis also partnered with Kenyatta for several years, helping pay for some of its doctors to study kidney transplant techniques at a Barcelona hospital. Novartis declined to comment on whether its staffers had seen detained patients at Kenyatta or whether it approved of the practice. “We do not support this in any way, but the problem has been documenting where it happens,” said Soucat, director of WHO’s department of health systems, financing and governance. To date, WHO has made no attempt to collect data on hospital detentions and says such information is hard to find. The AP obtained patient lists, records and bills from about a dozen hospitals in Congo detailing imprisonment practices. And though WHO has issued hundreds of health recommendations, the agency has never published any guidance advising countries not to imprison people in their hospitals. Soucat said WHO officials in more than a dozen countries had expressed their concerns about detained patients to ministers of health, but that those discussions were private. Earlier this month, Kenya’s High Court ruled again that imprisoning patients “is not one of the acceptable avenues (for hospitals) to recover debt.” The case involved a man detained at Nairobi Women’s Hospital since June 25; the judge ordered his immediate release despite the outstanding bill. Kenyan politicians also will soon debate a proposed amendment to the country’s health law that will explicitly make patient detentions illegal.